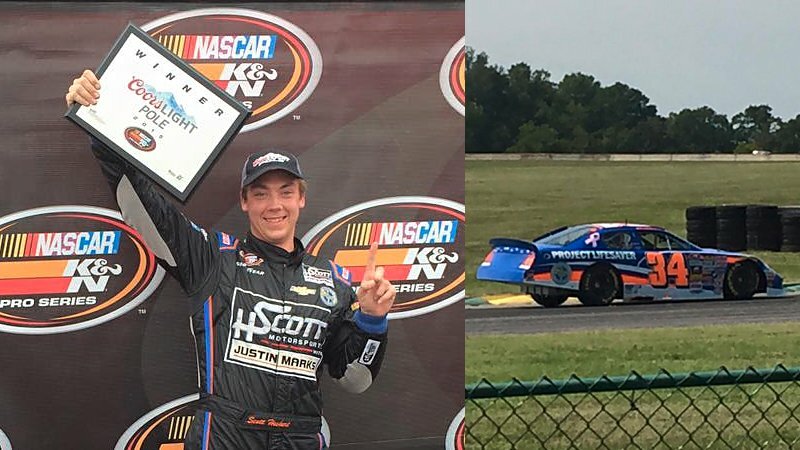 ALTON, Va. (August 30, 2015) – HScott Motorsports with Justin Marks (HSMJM) entered this weekend’s Biscuitville 125 looking to return to victory lane in the second and final road course event of 2015 at Virginia International Raceway (VIR). The day got started in the right way for HSMJM, with Scott Heckert capturing the Coors Light pole award, his second of 2015. Heckert entered the Biscuitville 125 looking to make it four in a row in the NKNPSE on road courses. The day started strong for the 21-year-old as Heckert picked up his fifth career Coors Light Pole award and second straight at VIR. As the race began, the Connecticut native showed the speed of the No. 34 Project Lifesaver Chevrolet, pulling out to a commanding lead and holding the top spot for 36 laps overall, the most on the day. At the halfway break, Heckert held the top spot and looked poised to bring home another solid finish, if not a victory at VIR. On lap 48, Heckert could feel an issue within his racecar. On his way towards pit road, the No. 34 suffered from a right-rear tire problem. This caused Heckert and the No. 34 to retire from the event, ending their day in the 15th position. Heckert remains second in the NKNPSE Driver Point Standings heading into Richmond in a couple weeks. The Biscuitville 125 airs on Thursday, September 3 at 7:00 p.m. EDT on NBCSN. The NKNPSE heads to Richmond International Raceway in a couple of weeks for the second-to-last event of 2015.